Soon after I wrote the Designing Fast Converging BGP Networks article, one of my regular readers sent me an interesting problem: BGP sessions would be lost in his (IS-IS based) core network if he would use fall-over on IBGP neighbors and the BGP router would have a primary and a backup path to the IBGP neighbor. We’ve identified the source of the problem (delayed SPF run) and I decided to document it. It took “a while” (and a kind nudge from Mateusz following a discussion on Cisco-NSP mailing list) to find time to set up the test lab and document the behavior. You can find the (undesired) results in the Aggressive BGP fall-over behavior in the CT3 wiki. Just in case someone from Cisco wants to put this on a wish list: please add a configurable delay to the neighbor fall-over command like you did with the bgp nexthop trigger delay command. Many thanks to those of you that responded with Netflix details (special thanks to Volcker for sending me the packet capture). Immediately after someone mentioned firewalls, I knew what the most sensible answer should be: to get across almost anything, use HTTP. No surprise, Netflix chose to use it. However, they’ve managed to deploy streaming video over TCP, which is not a trivial task. So, how did they do it? The first trick is relatively easy: instead of streaming the whole content, the player reads smaller chunks of video files from the server. If the next chunk is downloaded before the previous one is completely played, you have an uninterrupted viewing experience. They encode the chunks in the URL. They could have used the Range HTTP headers, but obviously decided to go with a more straightforward approach. The next trick is the variable bit rate: they can switch between different encodings of the same content on-the-fly, making it easy to adapt to bandwidth fluctuations. You can view different video sources being fetched for the same movie in the summary of capture I’ve received. To summarize: nothing revolutionary (but you wouldn’t expect new protocols in residential environment where you have to keep a tight control on the support costs), but a lot of good ideas and sound engineering. I’m impressed. I’m switching to the “traditional” summer schedule: until mid-August, I’ll post two to three shorter articles per week. I don’t want to spend too much of my vacation time writing, but I also don’t want to see you bored with dormant blogosphere. Some of my projects will simply have to wait for the temperatures to drop, including a few selected Service Provider issues I’ve started writing about in the last weeks and the ADSL QoS topics (don’t worry, I haven’t forgotten them). 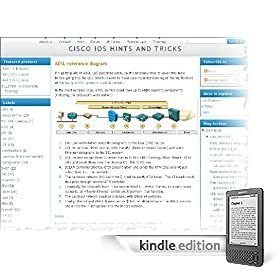 If you have a Kindle, you can subscribe to the Kindle edition of the Cisco IOS Hints blog. The monthly subscription charged by Amazon is $0.99 (the price is set by them and I cannot influence it) and (in the spirit of full disclosure :) I get 30% of the revenue. In most cases, the SVI interface tracks the state of access and trunk ports using the VLAN. The details are well explained in the Understanding SVI Autostate section of the Cisco IOS documentation. The important part of the SVI autostate calculation is the “port is in STP forwarding state for the VLAN” requirement. If a VLAN is not carried in a trunk port (for example, due to switchport trunk allowed configuration command), the trunk port’s status does not influence the autostate. In some IOS releases, you can exclude the individual physical ports from the autostate calculation with the switchport autostate exclude interface configuration command. Most commonly you’d want to exclude uplink ports on access switches. In some unspecified IOS releases (including 12.4T), you can use the (currently undocumented according to Command Lookup Tool) no autostate VLAN interface configuration command, which disables the autostate algorithm and makes the SVI interface permanently active. I have configured a L3 VLAN interface on a Cisco 3750 switch and assigned an IP address to it. I haven't assigned any ports to this VLAN. Why am I not able to ping the IP address of the VLAN interface from the switch itself? The VLAN interface (like any other interface) has layer-1 and layer-2 state. The layer-1 state is displayed in the Status column of the show ip interface brief command, the layer-2 state in the Protocol column. A VLAN interface is always up, but its line protocol state tracks the state of attached ports: if at least one port is operational, the line protocol of the VLAN interface is up, otherwise it’s down. With no ports assigned to a VLAN, the line protocol of the VLAN interface is down, its IP address is not in the IP routing table and thus you cannot ping it. I received numerous complaints about the inability to write comments to my blog in the last few weeks. I had comment-related problems for months, but the situation was getting out of control: initially only the Internet Explorer users had (manageable) problems, then it spread to some Firefox users, later it became impossible to submit comments at all and the last marvel in this buggy saga was the “automatic” conversion from Publish request to preview screen. I had enough, Google has yet again proven that you usually get what you pay for. Today I stumbled across a blog post shared by one of my Facebook friends that mentioned JS-Kit services. I also happened to have a few spare creative hours (one of my appointments was pushed forward) and tried the JS-Kit comments on one of my rarely-visited blogs. After the initial crashes I got it to work and implemented it on the IOS Hints blog. If you’ll experience any problems with the new system, please let me know (get in touch with me via my e-mail web form if you can’t leave a comment). Notice to NOSCRIPT users: you have to allow scripts from JS-KIT.COM if you want to leave a comment; you should have no problems seeing the already posted ones. I'm looking for details on how Netflix streams videos over the Internet. I've found their description of encoding and bit rates, but was not able to find lower-layer details (I can only assume they use UDP, but I would like to verify that with someone who's actually using the service). I would also appreciate any information on whether they work with Service Providers (for example, using local direct peering) to ensure the upstream Internet connections are not clogged with streamed video. Following the ADSL QoS discussions, I decided to test “a few” things in the lab. I didn’t want to build a huge lab with DSL modems and DSLAM and decided to emulate an end-to-end DSL network with routers. Step 1: Create a PPPoE session between a client (SOHO router) and a server (NAS). I’d never configured it before, so I’ve visited uncle Google first. It gave me tons of useless hits (no wonder) and a few somewhat useful ones. All of them used the old VPDN-centric PPPoE syntax. It seems I’ve stumbled across another “niche spot”: PPPoE testbed implemented with recent IOS configuration syntax (bba-group). Read more in the “PPPoE Testbed” article in the CT3 wiki. I'd like to use the snmpset command to get my router to execute an EEM script. Are there OIDs that are associated with EEM scripts that could help me achieve this? Although EEM has associated MIB, it has a single read-write variable: the size of the history table. It's thus not possible to use EEM MIB to trigger EEM events. However, EEM 2.4 added support for SNMP notification events, which you can use to trigger EEM applets based on incoming SNMP traps/informs. You can therefore use the event snmp-notification command on a router and the snmptrap command on a Linux host to remotely trigger EEM applets. Read more in the Trigger EEM applets with SNMP Informs article in the CT3 wiki. According to FeedBurner statistics, my RSS feed had exactly 5000 subscribes on June 30th. Disclaimer: The Feedburner subscriber count is a notoriously unreliable measure, as it tries to estimate the actual number of subscribers for on-line services that cache the feeds (for example, Google Reader) … but the result is nonetheless quite nice.